Did you know that the beauty of colored hair depends on the five most important factors? They have to be shiny, moist, regenerated, flexible and dazzle with intense color. Therefore we created Tutti Frutti Collagen Procolor shampoo, based on 5D COLOR PROTECT formula. This new five-dimensional technology was specially developed for color-treated hair. It protects hair from harmful UV rays and leaching of color, moisturizes and regenerates them, restores elasticity and shine. Hair Care Never Smelled So Sensual! COLLAGEN – nourishes hair and makes them more flexible. 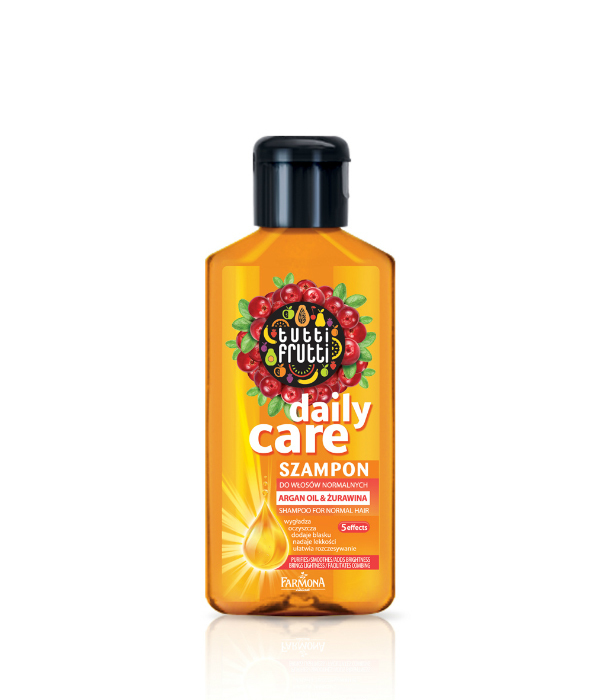 Creates a protective shield on a hair sufrance, which keep them safe against external factors. FruIT UV system – the rich composition of vitamins and fruit acids. It nourishes and intensively provides rehydratation to even very thin and damaged hair, also protects color-treated hair against sun damage. VISIBLE EFFECT: colour and glow. Apply a small amount of shampoo to wet hair, massage gently and rinse. Repeat if you want to enhance the effect.